I still get a thrill whenever I get my hands on a confidential memo with “The White House, Washington” appearing on the letterhead. Even when—like the one I’m looking at now—it’s about a snoozy topic: This week’s G-20 summit. And the French are furious. The White House letter to the G-20 leaders was a response to a confidential diplomatic missive from the chief of the European Union Fredrik Reinfeldt written a day earlier to “Monsieur le Président” Obama. We have Reinfeldt’s confidential note as well. In it, the EU president says, despite Bernanke’s happy-talk, “la crise n’est pas terminée (the crisis is not over) and (continuing in translation) the labor market will continue to suffer the consequences of weak use of capacity and production in the coming months.” This is diplomatic speak for, What the hell is Bernanke smoking? May I remind you Monsieur le Président, that last month 216,000 Americans lost their jobs, bringing the total lost since your inauguration to about seven million. And rising. The Wall Street Journal also has a copy of the White House letter, though they haven’t released it. (I have: read it here , with the EU message and our translation.) The Journal spins the leak as the White House would want it: “Big Changes to Global Economic Policy” to produce “lasting growth.” Obama takes charge! What’s missing in the Journal report is that Obama’s plan subtly but significantly throttles back European demands to tighten finance industry regulation and, most important, deflects the EU’s concern about fighting unemployment. Europe’s leaders are scared witless that the Obama Administration will prematurely turn off the fiscal and monetary stimulus. Europe demands that the US continue pumping the economy under an internationally coordinated worldwide save-our-butts program. As the EU’s Reinfeldt puts it in his plea to the White House, “It is essential that the Heads of State and Government, at this summit, continue to implement the economic policy measures they have adopted,” and not act unilaterally. “Exit strategies [must] be implemented in a coordinated manner.” Translating from the diplomatique: If you in the USA turn off fiscal and monetary stimulus now, on your own, Europe and the planet sinks, America with it. Obama’s ambassador says, Non! Instead, he writes that each nation should be allowed to “unwind” anti-recession efforts “at a pace appropriate to the circumstances of each economy.” In other words, “Europe, you’re on your own!” So much for Obama channeling FDR. The technical policy conflict between the Obama and EU plans reflects a deep difference in the answer to a crucial question: Whose recession is it, anyway? To Obama and Bernanke, this is a bankers’ recession and so, as “stresses in financial markets have abated significantly,” to use the words of the White House epistle, then Happy Days Are Here Again. But, if this recession is about workers the world over losing their jobs and life savings, the EU view, then it’s still Buddy, Can You Spare a Dime. If Bernanke and Obama were truly concerned about preserving jobs, they would have required banks loaded with taxpayer bail-out loot to lend these funds to consumers and business. China did so, ordering its banks to increase credit. And boy, did they, expanding credit by an eye-popping 30%, rocketing China’s economy out of recession and into double-digit growth. But the Obama Administration has gone the opposite way. The White House letter to the G-20 calls for slowly increasing bank reserves, and that can only cause a tight credit market to tighten further. It’s not that the White House completely ignores job losses. The US letter suggests, “The G-20 should commit to …income support for the unemployed.” You can imagine the Europeans, who already have generous unemployment benefits—most without time limits—turning purple over that one. America’s stingy unemployment compensation extension under the Stimulus Plan is already beginning to expire with no live proposal to continue aid for the jobless victims of this recession. The Europeans are so cute when they’re angry, when they pound their little fists. Obama assumes he can ignore them. The EU, once the big player in the G-7, has seen its members’ status diluted into the G-20, where the BRIC powers (Brazil, Russia, India and China) now flex their muscle. But Europeans have a thing or two to teach Americans about the economics of the twilight of empire. Maybe the differences are cultural, not economic; that Europeans lack America’s Manifest Destiny can-do optimism. So, to give the visitors a taste of the yes-we-can spirit, Obama should invite Pittsburgh’s 93,700 jobless to the G-20 meet to celebrate that 35% rise in the stock market. 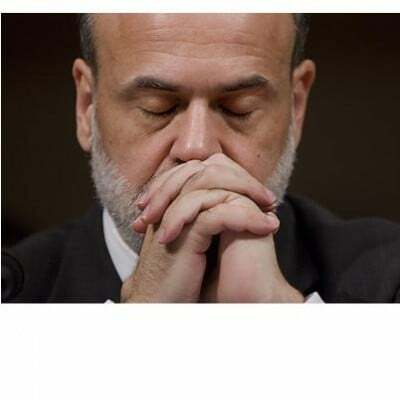 Or — my own suggestion — change Bernanke’s medication. For the entirety of the White House-EU exchange, go to GregPalast.com. Greg Palast is the author of The Best Democracy Money Can Buy. Palast wrote the column, “Inside Corporate America” for the business section of Britain’s Observer newspaper.